Chef Jimmy Ophorst in Pru Jampa. It might be the scent of pine needles; the colour of a wild herb. Or maybe the way native grasses form a nest. Whatever it is that catches the attention of acclaimed young chef Jimmy Ophorst during one of his regular foraging forays, staff at Phuket's PRU restaurant know it will more than likely be used in an inventive or tasty way in the kitchen. "We never look for something specific – our forage depends on what nature has for us at the time," says Ophorst, 27, or "Chef Jimmy", as he is known. He may be young, but this chef from The Netherlands has quickly forged a name for himself not only as an excellent new fine dining find, but also as a force behind PRU's trailblazing food philosophy. 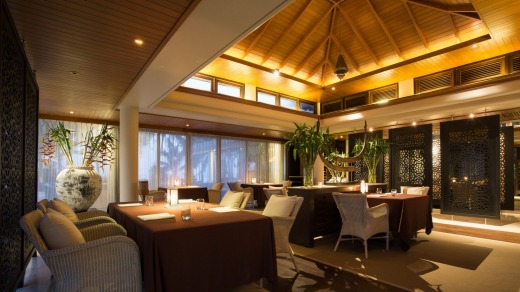 PRU stands for Plant Raise Understand and it is this mantra that underlines everything that this restaurant, which opened last year at the luxury Trisara resort in north-western Phuket, does. All of the ingredients used in the kitchen are sourced from within Thailand, with more than 75 per cent coming from Phuket. Seafood is caught in the waters off the island and PRU makes its own goat's cheese and butter using milk from local farms. Plastic is discouraged across the resort and recycling is done wherever possible. A reverse osmosis filtration plant provides all drinking water. 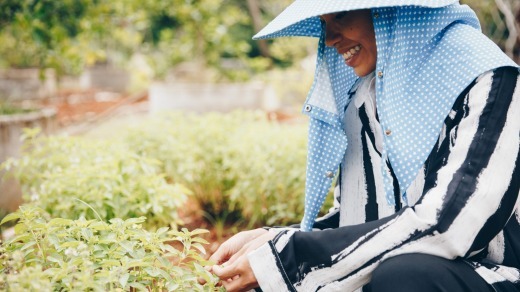 But most importantly, many of PRU's fresh ingredients are sourced from Trisara's own working farm, Pru Jampa, a 96-hectare property just a 20-minute drive away. Here fruit, vegetables, herbs and spices are grown organically on a cleared area which takes up just over 6.5 hectares and is also home to free-range chickens and ducks and natural lakes full of native catfish, also on the PRU menu. The farm is also a depository for the restaurant's kitchen waste which is used in compost. The concept of sourcing locally extends to the farm workers – many of whom worked farms nearby. They initially shared their techniques and then were offered jobs. There are also plans to eventually raise livestock on the farmland. But perhaps the most amazing part of Pru Jampa is the remaining 89 or so hectares which have been left as native forest. It is here you might catch Chef Jimmy tearing through the jungle armed with a basket, secateurs and a keen sense of smell. "Once a week my team and I will walk into the jungle of Pru Jampa, just to see what is happening in there," says Ophorst, who has been at Trisara for two years and helped devise the whole PRU concept. "We harvest mostly different kinds of sour leaves, herbs and wild flowers. Sometimes we are also able to catch young bamboo shoots which we use in our quail dish." Chef Jimmy's forest expeditions often also result in new ways to present food: he might find an ornamental flower, or some grasses or reeds that could serve as a "nest" for bread. And this inventive chef's foraging is not confined to the forest: he is also a keen beachcomber and has picked up beautiful pieces of driftwood to use in the restaurant. One dish is served on tiles that were once earmarked for the bin at a local tile factory. The idea that to eat locally and sustainably is to eat well, is one now well explored in Western fine-dining restaurants. But it's a concept relatively new to Thailand. The chance to be in the forefront of this type of food revolution in Asia was a strong drawcard for Ophorst, who previously worked at Gaggan in Bangkok. "In the world of Western food and fine dining a lot of restaurants have taken this road," he says. "However in Asia, it's quite a new movement, especially in Thailand. When we first started devising the PRU project in February 2016 we were the only ones in Thailand who did it on a fine dining level. Now in Bangkok new restaurants with this concept or similar are opening weekly. This means we are heading in the right direction. This new movement is exactly what Asia needs right now – going back to the basics instead of importing everything from Europe." PRU's gamble has paid off handsomely, with the restaurant earning outstanding reviews. Ophorst has also been named for a second time as a semi-finalist in south-east Asia in S. Pellegrino's Young Chef Competition for a dish which sings the praises of one vegetable – cauliflower. 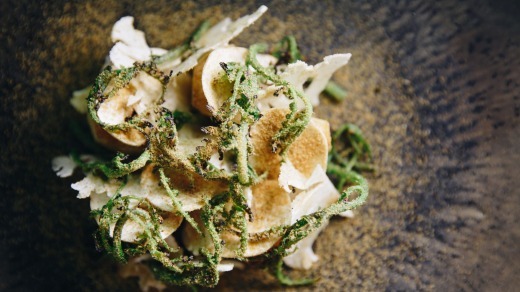 "Real food means real flavour," says Ophorst, whose "cauliflower stem cooked in brown butter and served with bone marrow cream, foraged mushrooms and sardine powder", underscores this notion. The ability to enhance the flavour of one ingredient is something dear to Ophorst's heart and he stresses, is something only made possible with exceptionally fresh ingredients. "Every day we discover something new [at Pru Jampa] but the major discovery will be something like growing just a tomato, I guess. You need to put so much time, love and passion in farming but in the end, the result blows you away when you can grow a better tomato than the ones in Europe," he says. "Once you see the process of how a tomato is grown you will respect the ingredient much more and cook them with more love." So what does Pru Jampa look like? A bit like a mini-farm/plant nursery surrounded by jungle. There are vegetable beds full of eggplants, zucchini, spring onions, lettuces, carrots (these are hard to grow in Thailand apparently but Chef Jimmy has found myriad ways to use the resulting, somewhat stunted vegetables, including the greenery of the carrot tops.) There are also fruit trees – oranges, lemons, kaffir limes (pounding the flesh of these and rinsing the hair with the pulp is apparently excellent for the scalp). There are also the more exotic wingbeans, rosellas, many types of chilli and five varieties of basil, all of which are used in one classic "Jimmy dish". Many of Trisara's guests, particularly the Koreans and the Chinese, are mad on the humble passionfruit and there are plenty of varieties grown here, from the purple ones we are used to seeing in suburban Sydney backyards to more exotic green varieties. There are ponds of floating lotus, a chicken coop – though chickens and ducks dot the landscape – and the previously mentioned lake, where local fishermen are spotted throwing catfish lines. Surrounding the cleared farm area is lush native forest, alive with the hum of insects and the cries of swooping birds. 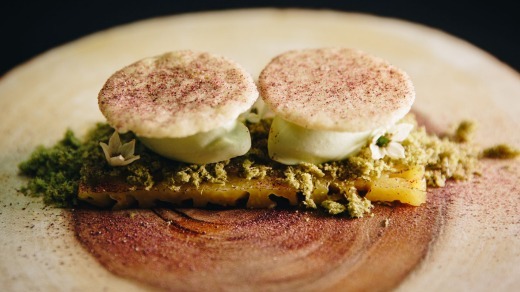 And it is here that Ophorst gained inspiration for a dish he has become known for – "Roasted Phuket pineapple in jasmine caramel, foraged pine needle cake and a sorbet of Thai basil". This is a standout – partly because of the ultra sweet Thai pineapple (same name but very different from Australian pineapple), but mainly because of the pine needle cake, which exemplifies Ophorst's part mad scientist/part gourmand abilities. It's a much-needed madness in a world of food experiences that can often feel the same. A worker at Pru Jampa. 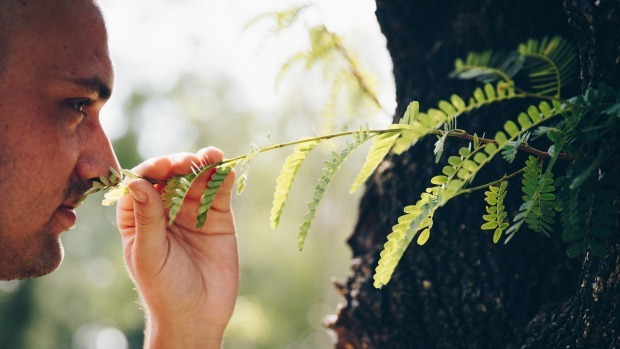 "When I forage, I look at the grass, branches, leaves, flowers, imagining what they can be or become. Of all the edible plants in the world, we only eat about 30 per cent. That means there is twice the amount out there waiting to be cooked and eaten. "One day, I saw these long elegant pine needles – not something you expect in Phuket. I was intrigued. First, I sprinkled sugar and dehydrated them. Terrible idea. I put the fresh needles through a juicer. Also horrible! Bitterness, with no nuance. I boiled the fresh pine needles, and voila! I knew what to do. I pressed the soft needles with my hands, until it turned into a powdery meal. Mixed in eggs, sugar and butter. It tasted like a crumble cake, something like the coarse crust of a pie. On the tongue, an uncanny hint of green tea. I had my breakthrough. I began to build the dessert. "A slice of young pineapple caramelised with jasmine flowers, a dollop of Thai basil sorbet, a coat of pine needle cake topped with a tuille of pineapple and rosella powder and young capsicum flowers. The flavours build on each other, the grasses, the trees, the flowers stand apart and together, just like they do in the forest. "It reminds me of lichen … a memory of the soft musky green earth that lives on Pru Jampa." 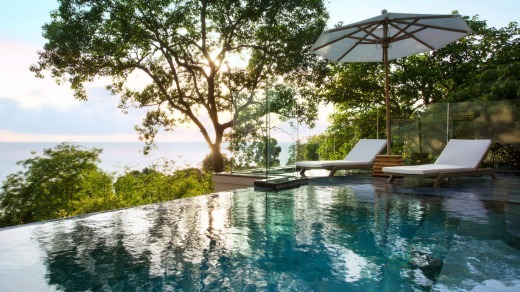 Trisara Ocean View villas from $US835 per night (low season) and from $1580 (January 11 to April 30) and $2285 (December 20-January 10). Jane Richards travelled as a guest of Trisara.